Filming a scene from "One Last Chance". Since Avid recently celebrated it's 25th anniversary, I thought it would an appropriate time to share my introduction to the nonlinear editing (NLE) system. I made my first short film in the early 70's when I was still in grade school. From that point on, I was hooked on film. college for film production and discovered video. 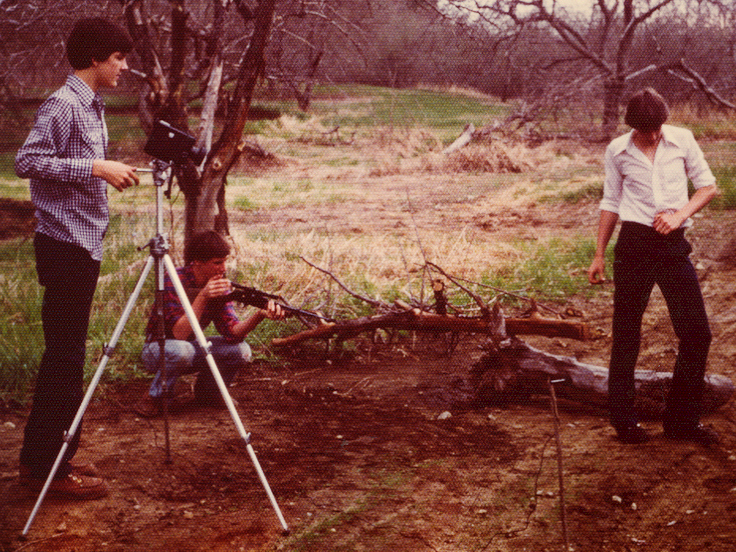 Editing video was so much easier than editing Super-8 sound film. The problem with Super-8 sound film is that it records the audio about 18 frames offset from where it records the image. This makes it a challenge when dealing with dialog (or sound of any kind). After college, I went to work for a local access cable TV station. Although I had been continuously making films since grade school, this was where I honed my skills as producer/shooter/editor. I kept my hands in computers as well, starting with an Amiga, an Apple II and then moving up to a Macintosh Plus. Around the same time, I started hearing about a company that enabled you to edit video on a computer. A colleague even had a demo video of the system. The demo showed how the TV series "The Visitor" was edited without having to wait for the shuttling of tapes, or recording from source to master. For me, the biggest deal about this computer-based nonlinear editing system, was that you could actually insert a shot at the beginning of a program without having to re-edit everything that followed. In the early 90's, a friend of mine, who was one of the original Avid trainers, told me about an opening in the support group. I was hired as employee number 102 at Avid and was one of the five telephone support reps when Avid Media Composer 3.x was released. At that point in Avid's history there was no formal training for support reps, we were given the computer parts and manuals and told to build the system, learn it and begin taking calls after about two weeks. While answering support calls, I met a lot of very cool editors and a few who liked to swear at you when asking for help. After doing technical support for a year, I transitioned to Corporate Editor and Tradeshow Support. I was the editor who cut the first Avid marketing video ever to be finished on an Avid system. Because video compression was still in its infancy, we had to re-shoot the whole video with flat lighting because a Project Manager was worried that any contrast would reveal too much in the way of JPEG artifacts. The properly lit shots looked 100% better than what we ended up with. After moving to Avid's marketing team, I began collaborating with another editor from Avid's DC office. Because of an NAB video we cut, video mixdowns became a necessary feature in the Media Composer. At the time we were using a console command to edit rendered effects media (precomputes) into a sequence. This was great, but because of the object count linked to the precomutes, it took about 5 minutes to play the sequence after clicking the play button. The great thing about being an editor at Avid - if you had a problem, ask an engineer. One of the engineers told us a trick on how to sever the connections to all of the objects associated to the precompute. After that, the sequence played immediately. During those years everything was done inside the Avid walls by Avid employees, including editing, composing music and sound design/mixing. At the end of the 90's I left Avid and started a production company with the editor I had collaborated with for so many years while at Avid. I met a lot of great people while at Avid, most I still consider good friends. These days although the Avid Media Composer is still my first love, I have to be NLE system agnostic. When the project calls for it, I will edit on any system including Apple Final Cut Pro, Adobe Premiere Pro or Sony Vegas. The above video is an NAB Teaser video we produced for NAB '96. The video below is an animated film I shot in Super-8 while still in college. "Subsys monpane debug" was a real life-saver in those days. We used that console command on every video we did.